Congrats, you have Google Analytics installed like the rest of the world. But the question is: is your Google Analytics configured correctly? Before diving too far into your Google Analytics dashboard, make sure you have everything set up right. After all, web analytics rely on having complete and accurate data in the first place. To get the most relevant insights from Google Analytics, you need to make some basic but important changes. This Google Analytics Quick Start Configuration Guide will help ensure you are pulling in accurate data from Google Analytics and you are not missing out on any relevant data that’s available. Many essential Google Analytics settings that are almost universally recommended are actually not enabled by default. Don’t forget Google Analytics cannot process any data retroactively. It is important to set these up ASAP to get the data flowing that otherwise wouldn’t. If you wait a month until you “get around to it,” well…that is one month of data lost. Precious, precious data gone forever! Configuration settings are found in the admin section of Google Analytics (gear icon). I know there is A LOT going on in the Admin section. Much more than the settings section of a typical SaaS tool. Try not to get overwhelmed and glaze over all of it. Take it step by step. We’ll start you off with a few of the important settings to address from the jump. 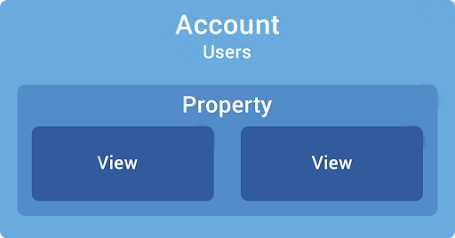 There are three columns in the admin screen: Account, Property, and View. First, we'll set up 3 views: a main view, a test view, and one for raw data. Let's start with the Raw Data view as that is the easiest one to set up. In Admin > View click the drop down under “View” and select “create new view.” Name it “Raw Data” and make no further changes (besides time zone). The whole point is you want one view collecting all data without filtering anything out to prevent data loss. Any data you filter out of your other views is gone forever so a raw data view is a safety mechanism. Name this view "Main view" and update the time zone. All changes below will be applied to this Main View. Remember we want to leave the Raw Data view alone. You will want to create your filters in the Account section The advantage of creating filters at the Account level (you can also set them up under View) is you can then apply the same filter to one or many views. This saves time and effort rather than creating the same filters multiple times in each view it’s needed in. You don’t want you and your internal team’s activity counting as users and pageviews in your analytics. Create a filter to exclude any traffic from your internal IP. You can see if the filter is working correctly by visiting a page on your website and then checking the real-time report. You should not see any activity in your Main View Real-time dashboard from your current, internal session because internal traffic is now filtered out. Note: you may want to exclude the IPs of other common locations as well. For example, if you or your team works frequently at a local coffee shop, consider excluding that IP. Toggle on “Remarketing” which will let you target ads to users who visited your site. The sooner you enable this, the sooner your remarketing audience starts to build (and the larger it will be). Even if you don’t plan to advertise, turn on “Advertising Reports Features” which you need to get the detailed demographic information GA offers (this is related to the above demographic setting we turned on). If you are not advertising with Google currently, you can skip this step. Next, under “Product Linking” add your AdWords, Adsense, and Ad Exchange accounts if you use those services. Under View Settings > Bot Filtering, check “Exclude all hits from known bots and spiders” to remove any traffic hits from automated bots and spiders that crawl your site. Bots crawl your site for various reasons like product comparison tools or search engines. Your pageviews will be overinflated if you don’t enable this option. Better to do now rather than finding down the road your (real human) traffic is much less than you thought! This will capture all the keyword searches visitors conduct on your site via the search box. This is great information to find out what people are looking for and expecting from your site. Goals are the basis of the all-important Conversion section. Let’s add a basic goal so you can at least start populating statistics in that section and see how it functions. Now you will be able to see conversion rate and other conversion metrics which are crucial to GA. Of course, you don’t want to stop here. Also add other relevant goals as soon as you can to start collecting conversion data. Other common conversion goals are a new e-commerce purchase or a new email subscriber. You really don’t want your tracking code to malfunction or your site to go down. Maybe worse, is not knowing these have happened! By setting up a custom alert, you can track and catch many things including sharp traffic drops, a potential symptom of Google Analytics (or your site) not working properly. Next, create a similar alert for Traffic Spike (same process just change condition to decrease instead of increase). Lastly, we are going to create a test view which is a view we can test any changes before making them live in the main view. This view should simply be a replica of you main view. So in the Main View under Admin > View > View Settings > Copy View name the view "Test View" and Click "Copy View" Voila you now have a test view identical to your Main view! There are many other important configurations, settings, and integrations in Google Analytics but these are a good start for a new Google Analytics account! We hope you enjoyed this Google Analytics Tutorial on how to set up and configure a new Google Analytics Account. As a next step into some more intermediate concepts, check out our on-demand webinar: Conquering Google Analytics.